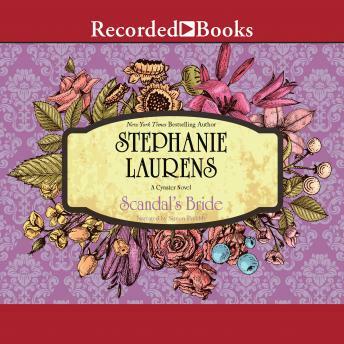 Stephanie Laurens authors USA Today best-selling historical romances such as A Rake's Vow and Devil's Bride. Lauren's Scandal's Bride is the hot and exciting third novel in her riveting Bar Cynster series. Cynster men are invariably handsome rogues, and Catriona Hennessy, Scottish Lady of the Vale is well aware of their reputation. She is aghast when it is decreed by her guardian that she must marry the scandalous Richard Cynster within one week's time. Like her mother before her, Catriona is a beautiful, independent woman who needs no man to rule over her or the Vale. But what she does need is an heir--will the charming Richard Cynster be willing to give her what she wants? Facing unavoidable marriage, Richard savors the challenge of taming spirited Catriona. Simon Prebble's masterful narration of Laurens' tale will leave listeners feeling exhilarated.